Rugby League in Britain is stagnating. Outside of the heartlands, the game isn’t growing. With a doomed project in Wales and Leigh’s catastrophic year in Super League behind us, now is the chance for us to really change the direction of the sport. A quote that has stuck with me about sport forever comes from the Moneyball film. ‘If we play like the Yankees in here, we’ll lose to the Yankees out there’. Of course in that scene Billy Beane was talking about player recruitment. However, it applies to Rugby League right now. For too long we’ve been trying to replicate football, and we can’t beat Football. We need to be bolder, be innovative and garner some attention. Promotion and relegation will never work in Rugby League, especially with the current ‘Super 8s’ setup. Most clubs have their business done by the end of October, but how can you do your transfer business if you don’t know what league you’ll be playing in? We saw this issue with Leigh this year, who have clearly failed to strengthen enough to challenge Super League. When the Super 8s system was introduced, it was designed to make sure a team is good enough to beat Super League opposition. That has ultimately proved a flawed system. For all of the faults of franchising, it gave us more stable clubs than promotion and relegation ever could. Teams like Halifax or Featherstone don’t want to jeopardise their future financial security to have a gung-ho tilt at Super League, when it could all too easily come undone, leaving the club in a mess. This will leave us with 3 or 4 ‘yo-yo’ teams, jumping up and down the divisions and constantly reshuffling their squad, which isn’t good for their fans, their owners or the sport. On paper, promotion and relegation is a fair system for our sport. In practice, it’s unfair on everyone. As evidenced by Toronto, there is an appetite for our sport across the pond. They’ve embraced the sport and smacked their own unique mark on it, and it’s the best thing that’s happened for Rugby League in a long, long time. So, if Rugby League is to truly progress as a sport, we need to get to America before Rugby Union does. The NFL, while still smashing the market, is starting to waver. We have a similar product without the issues marring the NFL league right now, we need to take advantage of that, fast. Too many American teams in one predominantly British league system will be too much, so I say we split it into ‘Conferences’, like the NFL. 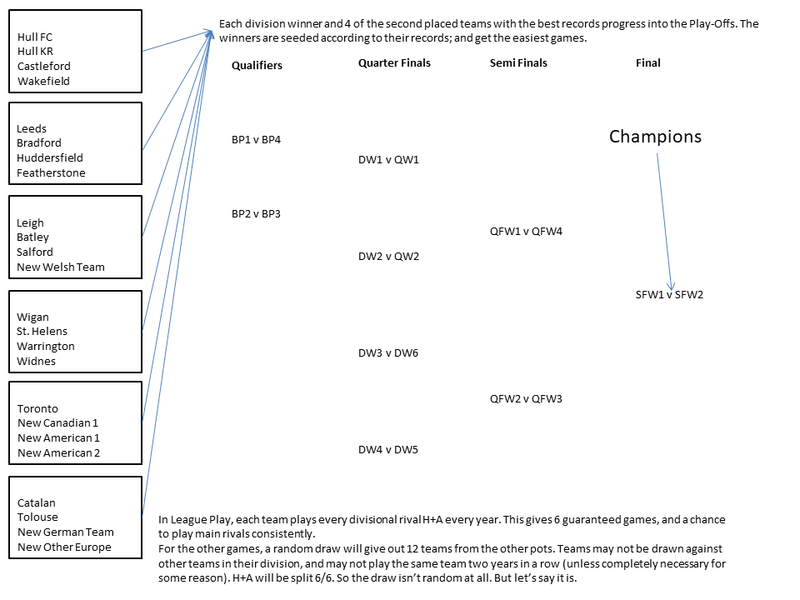 Split Super League into 6 divisions of 4 teams, based on their location and potential rivalries. This system provides the perfect mix of local rivalry and important games that can be marketed far stronger as they are rarer. Clashes between Hull and Leeds, Wigan and Leigh etc. would all become massive games as well as the important divisional games, meaning every game truly matters (until a team has qualified), which, unless in a weirdly non-competitive division, is rare. One big thing is missing from the system. Promotion and relegation are all but scrapped in favour of a franchising format. Clubs who wish to be promoted would apply to be promoted and would have to meet strict entry standards, to ensure each club entering the division is stable enough to support being a club in Super League for a long time. Over time, three new divisions would be created, and the league would stop at 32 teams, like the NFL. After the league has expanded to its limit; a promotion and relegation system could be reintroduced, involving a play off for the worst teams in each region, and the ones who wish to replace them, creating half a dozen or so high pressure, ‘million pound’ games. These could even be split over two legs, to milk even more money. To compensate for the lessening mobility, a new cup would be introduced for clubs in the Championship and below, with actual decent prize money for progression and victory. This would run alongside the Challenge Cup and the League. The Championship and below would remain largely the same. However, amateur teams would be allowed to be promoted into the League system, opening up opportunities to grow the game a lot in the heartlands, and widen participation with the chance to play in bigger competitions. In this new format, teams are playing far less games. Only 18 league games. This would provide a shorter season, and allow the development of an area we have forgotten as a sport, International Rugby League. As well as more England games, and hopefully beginning to compete with, and beat, the Australian teams, one-off games could be included. A return of the War of The Roses, Rest of the World v Britain, and an All Star game. These all provide a big TV opportunity and are great matches to watch for fans. The Challenge Cup Final would be moved back to May or June, to allow for a stronger focus on the League later on, so not all big games are left until the end of the year. This could also see a rise in attendances, as with the Finals not so close together, more fans could easily save in-between to attend both games. Magic Weekend would be moved in time, to the Quarter Final week of the playoffs. There would be 3 games on each day, two quarter finals and one ‘curtain raiser’, the Lower League Cup Final every year, and one that’s decided yearly for the other. This provides a great incentive for big crowds as each game means something, and a chance for Super League to put on a show. That’s structural matters dealt with. The pre-game stuff needs work. Get rid of the flags and team photo things that has to happen, let the players run on to a deafening roar from a passionate crowd. We need to sell the atmosphere, right now; it’s a brief roar before we realize there’s actually still five minutes until kick off! Of course, these changes are quite radical, and in a real world sense, would potentially be very hard to implement. Nonetheless, if we want progress, we have to take risks. Let’s sell our sport as it is, fast, exciting and hard-hitting. In my opinion, this system takes on a lot of the issues we see right now, and solves them. We have to try something, surely? The place where I can post things that are too long to go on twitter.